In a recent “Build Your Dream Boat” email, we introduced the principle of buoyancy and how any floating object pushes aside, or displaces, an amount or volume of water that’s EXACTLY the weight of the floating body. This all-up weight of the floating body we call displacement. In the following, we’ll extend our discussion on buoyancy and how we can relate it to hull balance. Why is this important? If you own a boat or are building a boat, it is common to want to make modifications in its layout or arrangement. In fact, such modifications are often one of the main reasons a person will choose to build his own boat; he can get it exactly the way he wants it. Such modifications, however, often involve moving and shifting things around, such as motors, tanks, batteries, galley equipment, and other major weights that can make up a substantial portion of the boat’s weight. However, if such changes are not made with a little forethought, the hull could be thrown out of balance, causing it to go down (or “trim” as it is called) at the bow or stern. The results could not only impair performance, but might result in an unsafe craft also. How does buoyancy work? The displacement of the boat is based on a certain hull volume or cubic measurement of space BELOW the waterline. For example, in salt water, each cubic foot of immersed underbody volume will support about 64 lbs. In fresh water, it’s a little less at about 62.5 lbs. per cubic foot. This means that while your boat may have a constant weight on its trailer on dry land, if you move it from salt water to fresh water, it will actually INCREASE in displacement; that is, push aside a GREATER volume of fresh water. This is because fresh water does not have as great an ability to support floating objects as salt water, and consequently your boat will sink somewhat deeper in fresh water even though its weight has technically not changed. That’s why it’s also easier to swim in the ocean–you displace less. Whether in salt water or fresh, the weight of the boat pushes down on the water by gravity, while the water reacts by pushing back with its support we call buoyancy. This force of buoyancy works through the center point of the immersed underbody hull volume and is called the “Center of Buoyancy” or CB. The designer determines this point in his calculations for displacement in all but the smallest boats. In most boats of normal form, the CB is usually somewhat aft of amidships along the boat’s centerline (assuming the boat is symmetrical or the same on both sides). If you are working from plans, the CB point is usually noted on the lines drawing at some point along the waterline. Conversely, the weight of the boat including everything aboard pushing downward is concentrated at a point somewhere along the length AND width of the boat. This point is called the “Center of Gravity” or CG. Now for IMPORTANT POINT #1: Even though the two points (CB and CG) may NOT be at the same position when your boat is out of the water and on its trailer, they will ALWAYS align once the boat is in the water. Now for IMPORTANT POINT #2: If the two points (CB and CG) are NOT at the same position when your boat is out of the water and on its trailer, your boat will go down by the bow or stern and/or tilt or “list” to one side or the other once in the water until the two points DO align, even if this means NOT floating on a level plane. In other words, a boat can be likened to a floating teeter totter with the CB serving as the fulcrum or balancing point. If the weights placed at each end are the same AND at equal distances from the fulcrum point, the teeter totter will be in level balance. But what happens if the weight of one of the objects at the end is different? Or the distance of the weight from the fulcrum point is NOT the same at either end? After a designer designs a boat and determines the CB point, he later must determine the weight of EVERYTHING that’s a part of the boat’s structure as well as EVERYTHING that will normally be carried aboard. This is tedious, but in addition, he must also multiply the weight of EACH item by its distance forward or aft of the CB point. The result is a listing of moments (a term representing the product of a weight multiplied by a distance and noted here as “foot-pounds”) both forward and aft of the CB. IMPORTANT POINT #3: The TOTAL of the moments forward of the CB MUST equal the TOTAL of the moments aft of the CB (or nearly so) if the boat is to float level. How does this relate to the person wanting to shift weight around in his boat or in the boat he is building? As long as the CB point is known, anyone can basically predict the outcome of any changes in the locations of weights that may be considered. Here’s how. Say you want to shift the location of an engine weighing 500 lbs. 2′ aft. The weight (500 lbs.) is multiplied by the distance (2′) for a moment of 1000 ft. lbs. Naturally this will tend to throw the hull out of balance and cause it to sink deeper at the stern while lifting the bow to some degree. Such a situation should be corrected if the boat is to perform as the designer intended. You do this by moving another object forward. The weight of this object and the distance it must be moved must also equal a moment of 1000 ft. lbs. This could be an item, for example, that might weigh 200 lbs., in which case we would need to move it 5′ forward to get 1000 ft. lbs. Similarly, if we know the moment needed and have the weight of an item we know that can be moved, we can divide the moment by the weight and determine how far the item will have to be moved forward. Or if we know the moment required and have only one place forward where something can be located, we can divide the moment by the distance in feet from the CB and determine what the weight of the item to be moved will have to be. However, watch out if you attempt to shift tanks or restore the balance of a boat by shifting them. As a general practice, tanks are preferably located as close to the CB as possible. The reason is simple. Since the fuel or water in a tank is an everchanging weight, if it is near the CB, these weight changes will have little effect in changing the trim of a boat because any moments will be minimal. However, if tanks are located at the ends of the boat, the moments will change considerably as the fluids in the tanks are used up, causing the boat’s trim to vary considerably between full and empty tanks. What happens if the moments are found NOT to be equal? If we know the displacement, this figure is divided by 12 to determine the “moment-to-trim 1 inch”; that is, the figure that will make the boat go down 1/2″ by the stern and up 1/2″ at the bow, or vice versa. The lesser sum of moments is then subtracted from the greater sum of moments giving an “excess of moments” which may be either forward or abaft the CB. The figure of excess moments is divided by the “moment-to-trim 1 inch” figure. The result is the amount the boat will be out of trim (don’t forget to divide this figure by 2 to determine the distance out of level at BOTH the bow AND stern). How much out of trim is too much? This is difficult to say; it’s like asking how many whiskers makes a beard. In most cases, a fraction of an inch one way or the other will not be detrimental to most boats. But if the figures get to where you can count the inches, then weights had better be re-shifted and the calculations done again so the boat can be put back on its lines. 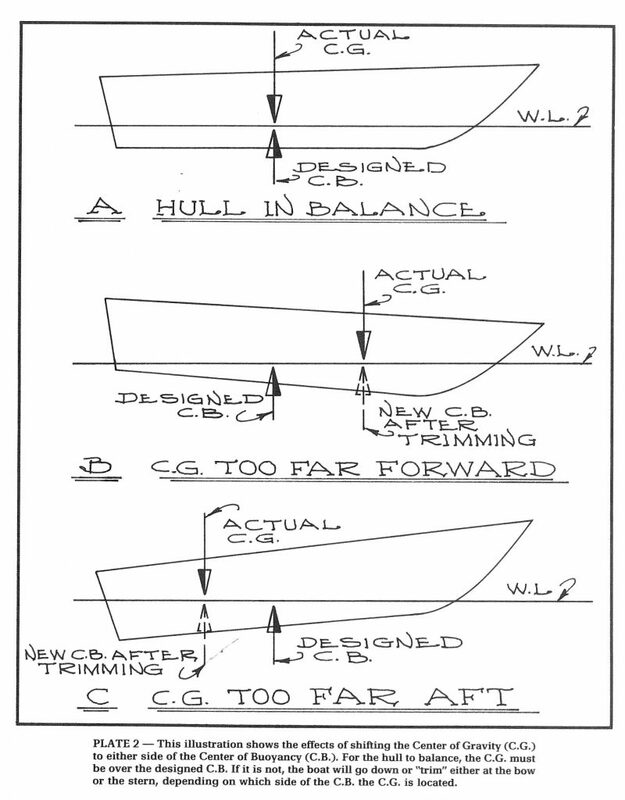 As far as balance in the athwartships directions, this is not normally as critical since most boats are arranged pretty much symmetrically about the centerline. While calculations can be made for unusual conditions, usually a spot check of the boat or design will indicate if there is too much weight on one side or the other that could cause a list to one side. One last tip: Try to keep major weights out of the bow–this can cause adverse structural loadings underway, especially on fast planing boats. NOTE: When it comes to planing boats, engine location and hull balance are VERY important. Planing hull forms can be such that volume may be arranged predominantly amidships, aft, or any point between. Usually boats with most of their volume amidships are intended specifically for centrally located engines; those with volume primarily at the stern are specifically intended for stern-mounted motors or outboards. Thus planing boats having their engines in a given location should not have their engine locations altered to any great extent. Ken Hankinson was a designer for Glen-L Marine from the 1960's to the 1980's when he started his own boat design business. Ken retired in 2004 but he was a prolific writer during his time at Glen-L and those articles continue to provide valuable information to boat builders.